High achievers sometimes razz each other to keep the competition hot — but also as a sign of mutual respect. 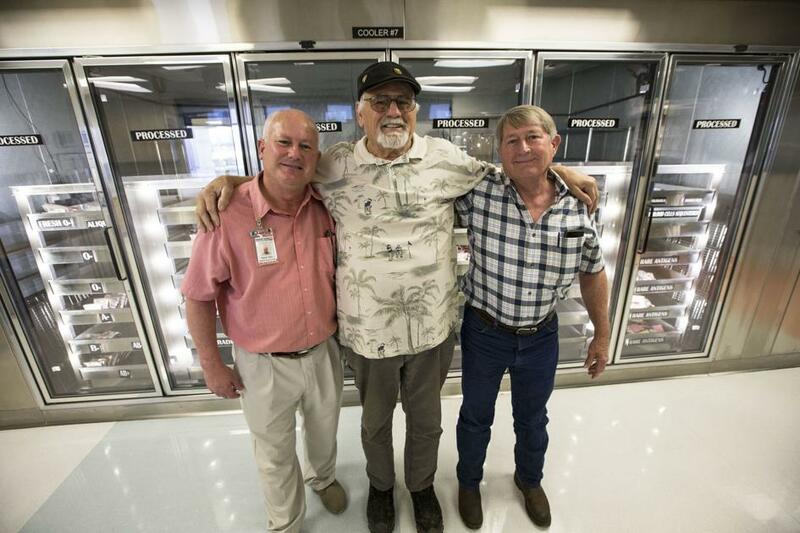 So when three blood platelet donors at the top of Houchin Blood Bank’s Gold Club donor list got together last week at Houchin’s Bolthouse Center in southwest Bakersfield to talk about the importance of donating blood and blood products, the competition was friendly. “I’m the oldest,” said James Goodmon, 70. “I’m the handsomest, quipped Patrick Clary. When asked to respond, Gary Ketchell, who’s at the top of the donor list, paused before saying a word. “I’m going to leave that alone,” said Ketchell, possibly the wisest of the three. All jokes aside, Ketchell, Goodmon and Clary represent three of the top four platelet donors in Houchin’s history. Tab Jay Haney, who has donated more than 1,000 units and is second only to Ketchell, could not be reached for this story. Between the three of them, they’ve given more than 3,000 units of blood platelets, a blood product that takes longer than whole blood to donate, but whose use is trending upward even as the need for whole blood is dipping slightly. While the average body contains nine to 12 pints of blood, a platelet “unit” is not quantifiable as that depends on the individual donating the blood product, healthcare experts say. Ketchell has donated 1,208 units of platelets, but he started in the 1970s with whole blood, and donated 13 gallons before switching to platelets at the request of staff. It’s a huge commitment. At an average of two hours per visit, some platelet donors are dedicating the equivalent of a 40-hour work week and more annually. They aren’t necessarily running into burning buildings. Some people go sit in a chair for two hours — and save people’s lives. But Clary, who manages the inventory of whole blood, platelets and other crucial blood products for Houchin, caught a glimpse once of a recipient. He had to deliver his own blood product one day to a cancer treatment center. He was astonished to find the patient receiving the life-giving fluid was a 4-year-old boy. After decades of donating blood and blood products, Goodmon has sailed over the 1,000-unit mark in platelets, and like Ketchell, stands at 13 gallons of red blood. “After a couple of weeks go by you start thinking you’ve got a little too much blood,” Goodmon said of than antsy feeling he starts to get when its nearing his next donation. Even after he found out he has Parkinson’s disease, Clary continued to donate. It’s harder for him to sit still than long, but he manages. “I want people to understand that just because they have a disability, it doesn’t necessarily have to exclude them,” he said. What Clary would really like to see is a consistent flow of donors. You don’t have to be superstars like Ketchell and Haney and Goodmon — and Mark Lewis, Jeff A. Jones, Kevin Mulhause, Randy Greenlee and may others. Just show up consistently, year after year. And if more first-time donors finally taking the plunge, it will reduce the pressure on the regulars. If his story inspire even one person to become a donor, Ketchell said, sharing it will have been worth it. Heroism comes in many forms. Sometimes it appears in a sudden and selfless burst of courage. Other times it’s characterized by years of unwavering dedication. Ketchell, Goodmon and Clary fit the latter category.